All the marketing campaigns which want us to consume more and more “20% more products”, “buy 2 get 1 free” and all the wasted food inside. Junk food and obesity are constantly increasing. Fast food companies sell ground beef with less than 50% beef. Products which are full of artificial flavors, nuggets without any chicken, “Horsegate”. Seed company lock up the market on seed genetics. The sellers of pesticides are destroying our earth with their army of lobbyists. International treaties “tafta”, “cesta” will require us to buy 2€ chicken. The scandal of the 1000’ cow farm. Ill-treatment on animals in the slaughterhouse. 5 agri-food companies possess the vast majority of the brands you can find on the market. In France, 4 big retailers have their hand on 96% of market share. This year we have seen industrial networks which have been accused of controling the price on the market, like “cartels” and finish with a rap on the knuckles. I dont want to talk about the mercury in the bottle of tuna fish or the epidemic of bird flu on the breeding goose every year. Did you remember the mad cow diseases ten years ago? People died because of that. The challenge of the next century is feeding the world, if we continue to eat as we do now what will happen next? In which direction do we go? I lot of people talk about good tasting food but in the same breath they tell you that it’s “expensive,” more expensive, in any case, than industrially-made food. But I don’t think that’s the case. I did a little experiment. 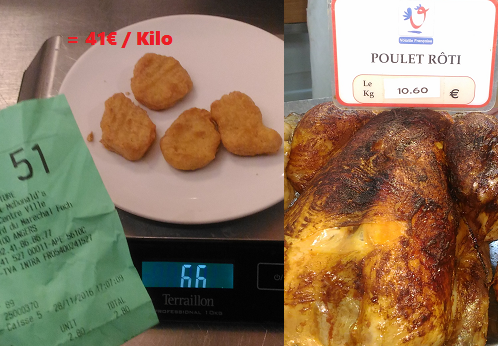 I went down to the local “clown” house restaurant and picked up a bag containing FOUR “Nuggets.” They weighed 66 grams in total and cost 2 euros, 80 cents. So they cost 41 euros per kilo! I don’t know if you realize how much that really is, but you can go down to the local street market and find free-range chicken at 10 euros, 60 cents! You can even pick up farm-raised steak for 20 euros!